Great coffee on the go - it's pretty much a birthright, isn't it? 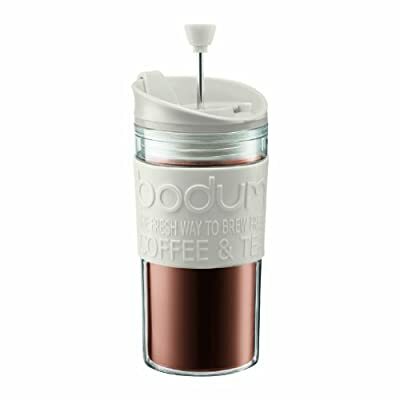 BODUM certainly think so. That is why they made getting your morning brew even more convenient. Instead of standing in a queue at the local coffee shop, you can make it in the comfort of your own home while getting dressed and ready for the day. It really is as simple as pressing a button to heat the water in a kettle. The ground coffee goes in the mug and, during the four minutes it takes to find your keys, develops to its full aroma. Press down the plunger and out the door you go. The double wall mug keeps your coffee hot - even while you wait for the darn bus on a snowy winter morning. The Travel Mug is made from plastic, rubber, silicone and stainless steel and comes in various colours. Caution: Please do always keep the mug upright. Due to safety reason, the mug is not leakproof because of possible over pressure.